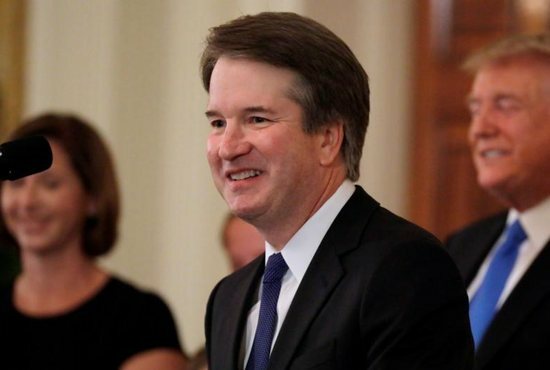 President Donald Trump announced July 9 that his nominee for the Supreme Court is Judge Brett Kavanaugh, a federal appeals court judge in Washington and a Catholic who once clerked for retiring Justice Anthony Kennedy. Kavanaugh spoke about his Catholic faith, saying he tries to live by the motto instilled in him by his Jesuit high school: “be men for others.” Kavanaugh, like Justice Neil Gorsuch, attended Georgetown Prep, a Jesuit boys school in Maryland. He also pointed out that his former pastor, Msgr. John Enzler, was in the audience. He said he he used to be an altar boy for him and now the two serve the homeless together. The priest is the president and CEO of Catholic Charities of Washington. Kavanaugh also gave a shoutout to the girls basketball team at his parish which he coaches. He said the team has nicknamed him “Coach K,” the name given to Duke basketball’s head coach Mike Krzyzewski. Reaction to Kavanaugh’s nomination was pretty much divided along party lines. Sarah Pitlyk, Kavanaugh’s former law clerk, praised Trump’s selection. She is special counsel for the Thomas More Society, a national nonprofit law firm dedicated to causes related to life, the family and religious liberty. “Judge Kavanaugh has a clear, consistent and solid record on the issues that matter most to social conservatives. He has repeatedly taken conservative stands and has fearlessly defended his textualist and originalist philosophy,” she said in a July 10 statement. “He is a good and decent man who will never waver in the face of pressure from any quarters. He is exactly what constitutional conservatives want on the Supreme Court,” she added. “No one can predict precisely how Judge Kavanaugh will vote, but the Federalist Society’s stamp of approval and his judicial record tell us that he will likely advance a pro-business agenda at the expense of workers and the most vulnerable in our society,” said James Roosevelt Jr., a board member of Catholic Democrats. Initial reactions to Kavanaugh’s nomination were somewhat muted from some who felt another top nominee, Barrett, would do more to overturn Roe v. Wade, the Supreme Court decision legalizing abortion.